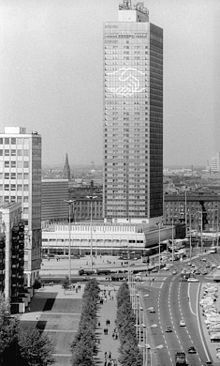 This is the Park Inn Berlin at Alexanderplatz. This is where I am going to spend a week’s researching, writing, and staring out the window. Warum? Alexanderplatz was originally a cattle market outside the city and was named in honour of the visit of Alexander I in 1805. It was the heart of decadent Berlin, alongside Potsdamer Platz, in the 20s, inspiring Doblin’s novel and Fassbinder’s adaptation, Berlin Alexanderplatz, and a place to board trains. It was also the site for the notorious police station that features in books and films, such as Hans Fallada’s Alone in Berlin, and served as a Nazi prison during the war. Now, it features a Burger King and a new department store. Less glibly, it is also the location of the Alexanderplatz demonstrations in 1989, which spoke out for the democratization of East Berlin and ultimately led to reunification. Demonstrators wore yellow sashes saying “No violence.” From cattle market to cabaret, from transport hub to prison, Alexanderplatz sounds like my kind of place. I travel in 34 days. But – who’s counting?